• 14 page manual with illustrations, color photos and step by step instructions. 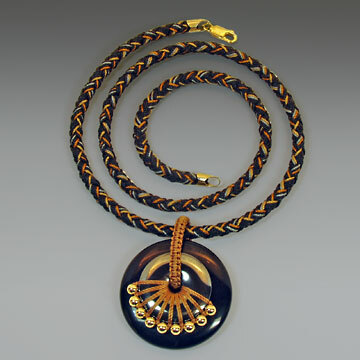 • Includes all the material for the project: donuts, beads, nylon and sterling or gold filled clasp. • See list of material included and suggested tools and glues! Techniques covered: Four Strand Kumihimo Braid, Maru Dai-Free and Disk-Free. Bead Edging around the Donut. Square Knot Loop. Finishing. $69.00 Allow 3-5 days for processing. • 15 page manual with illustrations, photos and step by step instructions. 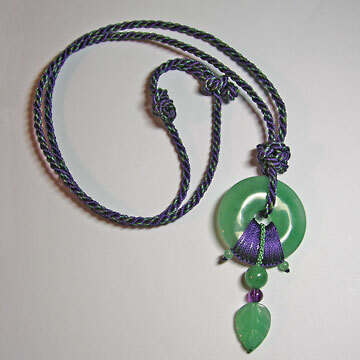 • Includes all the materials for the project: donut, beads, nylon and sterling silver clasp. Techniques covered: Four Strand Kumihimo Braid, Maru Dai-Free and Disk-Free. Knotting around the Donut. The Half Hitch Alternative Braid. Square Knot Loop. Finishing. • 15 page manual with illustrations, color photos and step by step instructions. 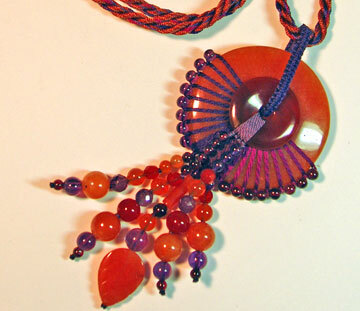 • Includes all the material for the project: donuts, beads, nylon and silk thread. Techniques covered: Bead Edging around the Donut with Silk Thread. Tassel. Square Knot Loop. 2 and 3-Ply Cordmaking. Finishing. $95.00 Allow 3-5 days for processing. • Includes all the material for the project, the donut (40mm in diameter), beads and nylon thread. • Tools and glues are not included. Techniques covered: The Chinese Button Knot with easy to follow instructions. The Larkshead knots around the donut. The Alternative Half Hitch Braid. 2-ply and 3-ply Cordmaking. 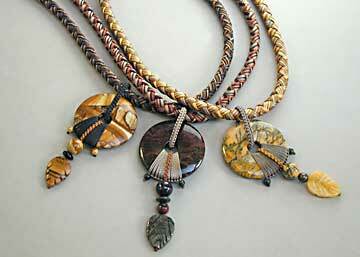 Adjustable Knotting for Cord. Finishing the piece. $75.00 Allow 3-5 extra days for processing. • 1 full color manual/booklet with many photos and illustrations. For U.S. sales the pages of the booklet are inside a bound clear cover presentation portfolio, for international sales due size restriction of shipping envelope the pages are inside clear plastic archival sheet protectors, temporarily bound by a cord and if desired ready for a 3 ring binder (not included). • All the design presented as kits have been taught in actual classes. • The step by step instructions have been tested and are updated regularly based on customer's feed-back and suggestions. • Each kit is assembled one at the time when the order is received. • Most beads and donuts are genuine gemstones, occasionally other material such as bone, horn or man-made materials such as Goldstone are included. • The kits are priced within range of actual classes, as each kit requires a fair amount of time to pack as many color choices and options are available. • Each kit has some techniques that are unique, although some techniques are presented in more than one kit. • Once you have purchased a kit, you can of course make many other pieces that are similar purchasing your own material as long as you do not commercialize them (see copyright agreement). And of course, using the techniques taught in the manuals, you can develop your own designs, style and finished pieces!